This book is the result of the authors' hands-on classroom experience and is tailored to reflect how students best learn to analyze linear relationships. The text begins with the introduction of four simple examples of actual data sets. These examples are developed and analyzed throughout the text, and more complicated examples of data sets are introduced along the way. Taking a multidisciplinary approach, the book traces the conclusion of the analyses of data sets taken from geology, biology, economics, psychology, education, sociology, and environmental science. The basics of statistical analysis are developed and emphasized, particularly in testing the assumptions and drawing inferences from linear models. Exercises are included at the end of each chapter to test students' skills before moving on to more advanced techniques and models. These exercises are marked to indicate whether calculus, linear algebra, or computer skills are needed. Unlike other texts in the field, the mathematics underlying the models is carefully explained and accessible to students who may not have any background in calculus or linear algebra. Most chapters include an optional final section on linear algebra for students interested in developing a deeper understanding. The many data sets that appear in the text are available on the book's Web site. The MINITAB(r) software program is used to illustrate many of the examples. For students unfamiliar with MINITAB(r), an appendix introduces the key features needed to study linear models. With its multidisciplinary approach and use of real-world data sets that bring the subject alive, this is an excellent introduction to linear models for students in any of the natural or social sciences. STEVEN J. JANKE, PHD, and FREDERICK C. TINSLEY, PHD, are both Professors of Mathematics at Colorado College, Colorado Springs. Both Dr. Janke and Dr. Tinsley have been teaching linear models courses for more than two decades. 1. Data: Plots and Location. 2. Data: Dispersion and Correlation. 3. Random Variables: Probability and Density. 4. Random Variables: Expectation and Variance. 8. Linear Models: Two Independent Variables. 9. 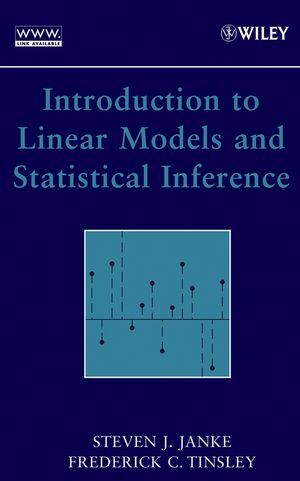 Linear Models: Several Independent Variables. Appendix C: Introduction to Linear Algebra. The exercises are a mix of both the theoretical and the practical; some are marked as requiring calculus, linear algebra, or computer skills. The text utilizes output from MINITAB to illustrate many of the examples. An appendix introduces the reader to MINITAB. The text includes an introduction to matrix algebra in an appendix for those readers who have a weak background in the topic. Optional sections are included at chapter ends for use in courses where the integration of linear algebra techniques is desired. The sections can be omitted without loss of continuity. The text can serve as a first course in general statistics for students with some mathematical background at the first-year graduate level or as a second course for those readers pursuing a more quantitative emphasis in the social or natural sciences at the undergraduate level. Actual data from readily available (interdisciplinary) sources is used both in-text and on an author-maintained web site. Both intuitive and mathematical explanations are given in an effort to balance the overall treatment and comprehension.